Talk about crashing out and being dead to the world! Mikey slept like a log all bundled up against the cold inside the monastery. Let’s face it, when you wake up and can see your breath that warm blanket is a godsend. We finally got a good shot of the monastery as we walked away from it around 7 am. Yes, we had to climb yesterday to reach Oseira, but (as per our guidebook) there was an additional “2km steep climb over rocky ground” that really served to wake us up in the absence of coffee. We did, however, encounter quite a bit of flatland and were able to take in more sights once the weather proved less threatening. 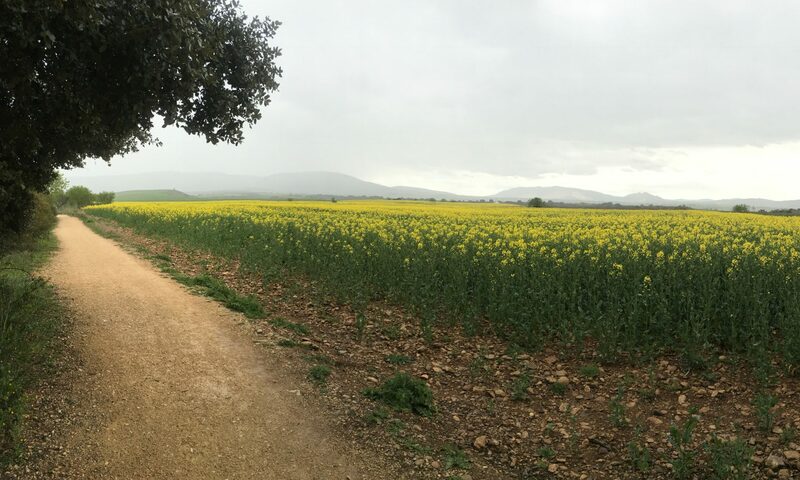 It really is amazing how beautifully desolate the Camino can be. To walk for most of the day without encountering another soul is maddeningly wonderful for our city-boy pilgrim. Let’s hope that his return to LA will not be too shocking. Following our meander through the open country, we entered into a forest for a bit of uphill climbing. Thankfully the path was relatively dry and we made good time. Joking aside, we had a restful afternoon during which we called Mikey’s sister (Hi Kerry! ), did laundry, went to a truck-stop diner, watched a movie, and generally relaxed. It seems like these 30km+ days have really taken a toll on our dear pilgrim. He still only sleeps 6 to 7 hours per night and is consistently one of if not the fastest walkers, but it remains a taxing adventure. Enter comfort food! The above is a Galician Stew which is cabbage and potato heavy and below that is a most tender boneless lamb steak with potatoes. Yeah, probably a bit heavy for 8 pm, but this was an amazing dinner. We’re going to miss this part, too. That is, burning so many calories hiking that we can eat whatever we want. Yeah, two big meals a day, sugar in the coffee, and wine and beer add up when you’re not averaging 20 miles per day. Well, vacations don’t last forever nor do our ramblings. That said, goodnight from the Camino and “may the road rise to meet you for as long as it takes to burn off your own indulgences.” Buenas noches, dear reader.